So those of you who follow me on Twitter will know that I am pretty damn excited to be going to London this weekend for some London Fashion Week activities! I sadly couldn't attend the show I was invited to (it's on Monday and I have work) but I decided to go down to London anyway as I have also been granted access to the Handpicked Media Blogger Suite! I am pairing it with a chance to see one of my very dear friends from Uni who I have not seen for a couple of years so I am delighted to be making this trip happen! My plans include heading down to Somerset House to take some snaps of the fash-pack, attending the #HPMLFW Blogger Suite, having dinner at my all-time favourite restaurant, Balans in Soho and having a lazy Sunday wandering around Spitalfields and Brick Lane Market.. bliss. I would love to meet any Bloggers who will also be attending the Blogger Suite - please send me an email if you are going so I know when people are heading in (if you want to of course!) and I can hoepfully meet some of you guys! So anyways.. here are some of my anticipated essentials for #LFW..
Across Body Bag: Just so I can have my hands free to accept goodies/take pics etc I LOVE this gorgeous studded number from Topshop! La Roche-Posay Cicaplast Baume C5: This stuff is truly awesome. Dry lips, randomly bushy misbehaving eyebrow, dry cuticles, dry skin on the face.. etc etc etc this is a one cream treats all job and I love chucking it in my handbag just in case. Essie Butler Please: I adore the shade of this polish, it's striking, luxurious and a nice pop of colour. A little too bright for my workplace but if I can't rock it for #LFW then when can I?! Clinique Chubby Stick: I have the Tomato Shade and the Strawberry.. these are fab for applying on the go and are a way of injecting some colour into your makeup. Ray Ban Aviator: ANY opportunity to wear these and I will take it. I am hoping that it is bright enough to wear them even if it's a bit chilly. Camera: I got this super cute Red Camera for Christmas and I am really enjoying being able to take snaps that are better quality than my iPhone! Business Cards: I want to share the SweetieSal name and get my blog out there so I have got some Moo.com Business Cards to hand out! Moo.com are really fantastic quality and whilst they are slightly more expensive they are very much worth it! Moleskine Notebook: Just incase I need to write anything down, I have a dedicated Blog Book of ideas/contacts etc so this will definitely be coming with me. Viva La Juicy: This is my fragrance du jour at the moment and I am loving it's gorgeous vanilla scent! iPhone Gloves: It's a wee bit nippy out there and these gloves ensure I can keep texting without having to have one freezing hand..
iPhone: I am a complete Apple aficionado and totally love my iPhone - this will help me keep in touch on the go and take part in Twitter excitement and get my Instagram on! Travel Card Holder: I plan to be a bit here there and everywhere this weekend so to house my Oyster Card in a glam surroundings I have this cute holder from Cath Kidston. iPad Mini: For blogging on the go, catching up on Magazines and relieving my boredom on any journeys the iPad Mini will be coming out and about with me! 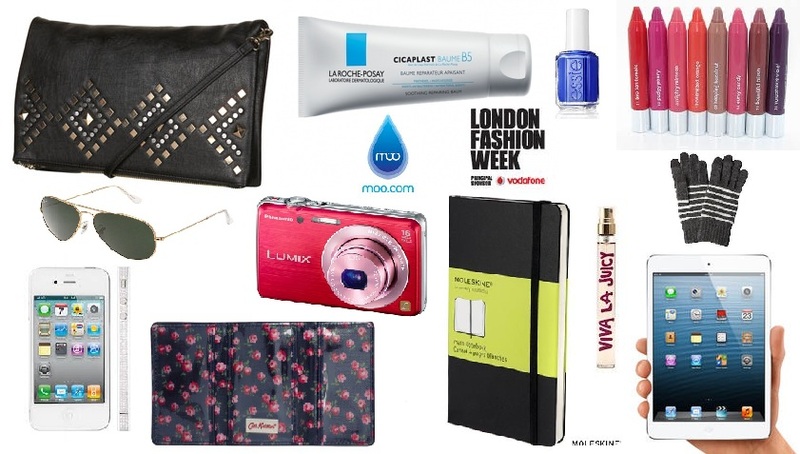 If you are heading to #LFW what are your essentials? i'm not jealous, i'm not jealous laalalala! awww wow >.< hope you had a wonderful time! !